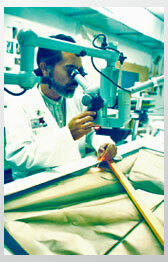 He is strongly concerned with several factors for the preservation of an object, including: determining the structural stability, counteracting chemical and physical deterioration, performing conservation treatment based on an evaluation of the aesthetic, historic, and also the scientific characteristics of the piece. Conservation involves examination, scientific analysis and research to determine original structure, materials and extent of loss, it also encompasses structural and environmental treatment to retard future deterioration. Needless to say that this profession demands of the conservators to have considerable practical experience, a broad range of theoretical and scientific knowledge and a true commitment to high standards and performance which we can perceive in Luis work. usually specialize in a particular type of conservation. Luis expertise relies on works on paper: artworks, rare books, photographs, and archaeological and ethnographic materials. Paper conservation is a skilled discipline, which requires a long period of training and dedication, the use of high quality materials and a specialized artist. You will expect to receive from Larrazabal Conservation a written preliminary examination report evaluating condition, proposing treatment, describing its limitations, and an estimate of cost and duration. Also a notification if needed, if major changes occur during the procedure with the alterated proposal and photographic documentation of the changes. Through Larrazabal's career he has restored works of renowned artists like: Salvador Dali, Joan Miró, Francisco Goya, Francisco Oller, Toulouse-Lautrec, Paul Klee, Augusto Marín, Lorenzo Homar, Lopez Dirube, Rafael Tufiño, Jack Delano, Ramón Frade, Librado Net, Epifanio Irrizary, Carlos Raquel Rivera, Carmelo Sobrino, Nini de la Torre, Rembrandt, Alberto Durero, Carmelo Fontánez, Cundo Bermúdez, José Campeche, Luis Hernandez Cruz, Burne Jones, Héctor Méndez Caratini, Renoir, Fernando Leger, Ríos Rey, Padmiño and Claudio Bravo. Compania De Turismo La Princesa. SJ, P.R. Museo Universidad Del Turabo P.R. Museo y Archivos De Pablo Casals San Juan P.R. Museo De Historia y Cultura Vegabajeña "Casa Alonso"
Museo Casa Amarilla, Caguas P.R. Collection of the President and Board of the University of P.R.